To Uluwatu Temple Bali for worship, some time ago, I was with my friends. To reach the temple required a long time. Because of my heading to Uluwatu Temple is tens of kilo meters. And somewhere along the way we stuck in traffic long enough. So the time we wasted. 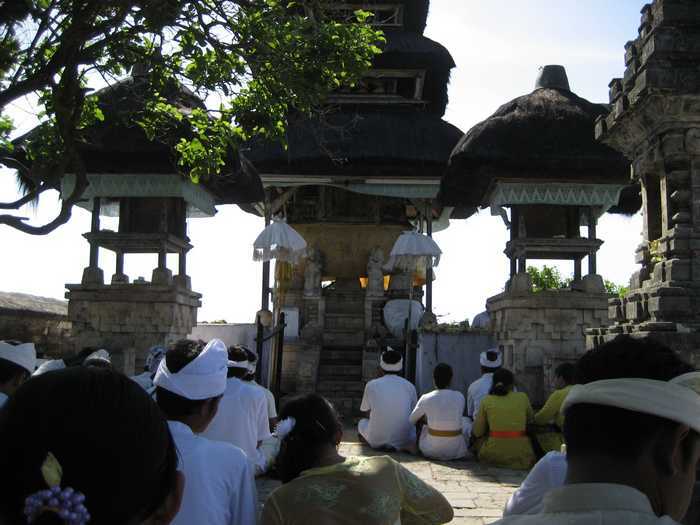 Arriving at Uluwatu Temple, which is located in Kuta, Bali, there are many people who come to the temple. They have the same goals as us, which is to pray at Uluwatu Temple. In the temple area there are many wild monkeys are quite alarming. We are dismayed by the monkeys. We fear they bite us. According to people who frequently pray to it, the monkeys often take people brought offerings. Besides aiming to prayer, we came to Uluwatu Temple to tour the region. Because the temple region has a very beautiful panorama, stunning nature and beautiful sunsets Uluwatu Temple Bali. And it is very well known to foreign countries. Which is amazing in this area is the temple that is located right at the end of a very high cliff on the edge of the Indian Ocean sea. Cliffs terrible to behold. It may be very suitable for suicide. Hahahaha ... Not advisable to do so. If you come to the Uluwatu temple, you will be impressed and amazed with nature there. High cliffs on the edge of the vast sea. If you are on holiday to Bali, I recommend to come Uluwatu.